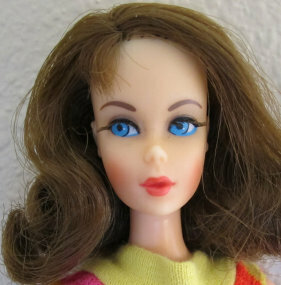 In 1967 Mattel made big changes to Barbie by introducing the #1160 Twist 'n turn Barbie. 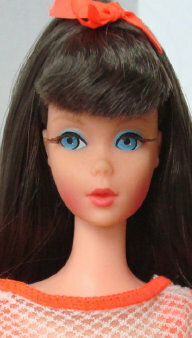 She had a new twist waist and a brand new head mold. 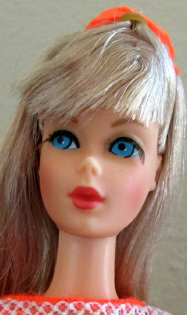 Barbie had blue eyes, long rooted eyelashes and pink lips. She was available in Sun Kissed (light blonde), Summer Sand (ash blond), Chocolate Bon Bon (dark brown) Go Go Co Co (light brown) hair colors. Also found are titian & platinum (rare) hair colors. She is marked: ©1966 Mattel, Inc./U.S. Patented/U.S. Pat Pend. Made in Japan. Mattel had a promotion going on. 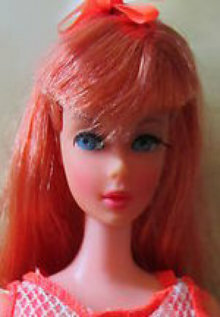 You could trade in an old barbie for the new twist and turn Barbie #1162 plus $1.50. And that is exactly what I did! Mattel gave the old dolls to charity. The only difference between the trade in and the store verion was the type box she came in. Also the #1162 did not come with a stand. In 1969 her hairstyle went from long to a new flip style often referred to as the "Marlo Thomas" doll from the television show "That Girl". In 1971 her eyes changed to center glance eyes rather than side glance eyes. The plastic stand doubled as a seat when turned over too. 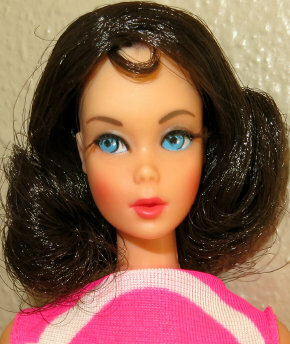 And one more thing, Barbie's swimsuit changed evey year too! 1967: Salmon colored vinyl bikini, salmon net covering, salmon hair bow, X-stand (only #1160), booklet. 1968: two-piece pink swimsuit with dimond patterned top, pink vinyl shorts, green belt, pink hair bow, stand, booklet. 1969: One piece diamond pattern colorful swim suit, yellow band around the neck, stand, booklet. 1970: One-piece pink & white abstract swimsuit, stand, booklet. 1971: One-piece pink striped swimsuit with pink stand up collar, stand, booklet.